Clare McGonagle from Strabane, who graduated from the University of Ulster with a 2:1 degree in International Hotel and Tourism Management this summer, has won the Da Vinci Cup for excellence in academic performance. 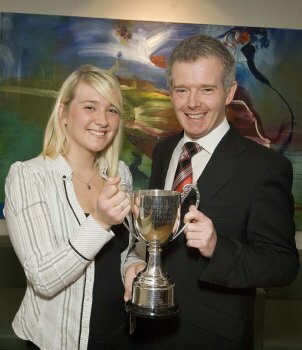 The Da Vinci cup, sponsored by Londonderry businessman, Garvan O’Doherty, is presented annually to the final year International Hotel and Tourism Management student who achieved the highest mark in the Strategic Management module. As part of her prize, Clare also won a voucher for two for the Ramada Da Vinci’s Hotel Complex in Derry. Congratulating Clare on her success, Frances Devine, Course Director for Hotel and Tourism Management said: “Clare was a fantastic student. Throughout her studies she was highly motivated, enthusiastic and determined to succeed. These are all essential qualities for a successful career in the hotel and tourism industry and we wish her all the very best. Claire, who is now working as a Bar Supervisor in Ten Square, an award winning boutique hotel in Belfast city centre, completed her industrial placement with the Connemara Coast Hotel in Galway. She said her time at the University of Ulster was an excellent preparation for a career in the hospitality industry. Clare adds that she may return to study herself but in the meantime is looking forward to doing some travelling to get a better understanding of the hospitality industry and now it differs culturally across the world.